Hey there, I’m John Taglieri from Dawg Pound Studios. Based in Hanson, Massachusetts, our studio boasts a 200 square foot live room full of drums, vintage amps, a ’64 Hammond, and close to 30 mostly-vintage guitars and basses to choose from. Our control room is full of great digital and outboard gear to help make sure we capture the music as accurately as it is performed—and make it sound amazing. I’ve produced close to 20 CDs for myself and clients, and as an engineer/producer have had two Billboard charting CDs (a #74 and a #112), a #1 single on Amazon, a total of 11 top ten singles on Amazon & iTunes, as well as a Best-Selling Alternative EP on iTunes. The studio has been touted as having a great-sounding live room, and a control room that sounds true. What you hear at the mix area is what it sounds like out in the real world as well. For my latest EP, Days Like These, we had a great and fun situation. We assembled top musicians from all over the country, including Kenny Aronoff (John Mellencamp, John Fogerty, Michelle Branch), Rich Redmond (Jason Aldean, Ludacris), Alan Bowers (Rachel Allyn), Chad Cunningham, as well as myself on drums. We also got Lee Turner (Darius Rucker) & Eric Ragno (Kiss, Alice Cooper) on keys and Greg Juliano on bass. Keith LuBrant, Joe Gilder & myself handled guitars, and we used writers from the US & Australia. Tracks were cut in eight different studios around the country, as well as at Dawg Pound Studios, and on all different DAWs. We then used DropBox to get the .WAVs to Dawg Pound Studios, where Studio One Professional 2 was used to assemble and mix all the tracks. Dozens of tracks were done in-house as well as sent in. All songs started at my studio with acoustic guitar, vocals, and click tracks, and ended with final mixes. The workflow was effortless. Working with Studio One and my FaderPort, mixing was a great experience. I had just added the FaderPort to the system and I can’t tell you how much it streamlines mixing. It makes subtle mix, pan and FX moves far easier than using my trackpad. I run a tricked-out Mac Mini with a Bluetooth keyboard and trackpad. We must have done something right because the EP debuted on release week on the Billboard Independent Album chart at #112, which was quite an honor. Running PreSonus in my studio has brought my studio up to a level of quality that I can truly be proud of. I am putting out sounds rivaling any other studio thanks to the quality of my inputs, the workflow, the ease of mixing, true quality stock plugins, great preamps, and I know my clients love the custom monitoring setup in the live room during tracking. Stop by the studio’s website and Facebook and check us out! It’s rare to find a truly outstanding solid-state channel strip that can deliver a vintage vibe reminiscent of classic high-end products, yet employs a thoroughly modern design. To find one that you can buy without heavily depleting your bank account is even more rare. But there is one channel strip that delivers the goods without the big tab: the PreSonus RC 500. Every instrument in this video was recorded through the PreSonus RC 500 – even the voice over! For more on the RC 500, click here. Check out this great video from SoundPure Studios, they’ve produced an incredible overview and demonstration of the ADL 700. And as if that wasn’t enough, the video features an amazing performance. Win-win! I’ve been eyeing this box since I first noticed it announced around the end of last year or so. 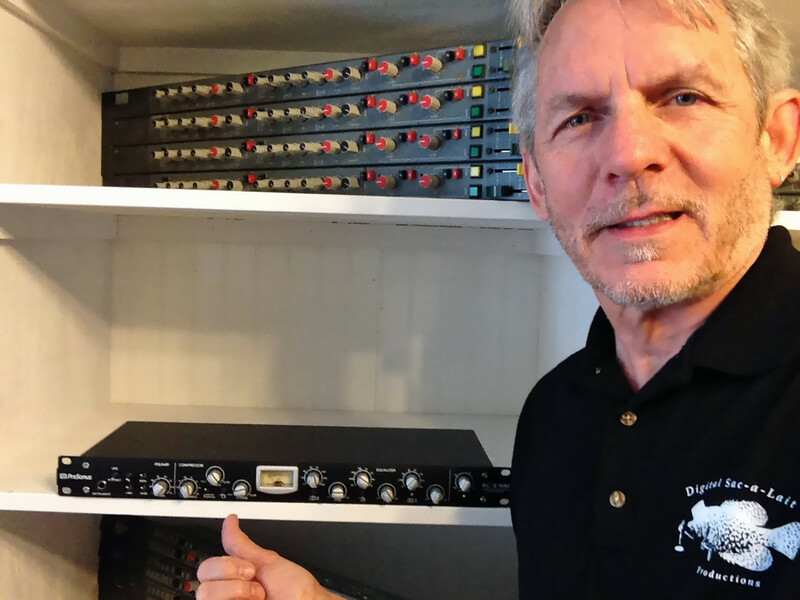 I own some boutique gear made in the USA. I also own a PreSonus MP20 that I purchased about 12 years ago. I ALWAYS considered that mic pre a sleeper. It’s way more high-quality than it gets credit for! I bought the RC 500 from SoundPure about three weeks ago. compressor is VERY good, but may take some getting used to because of the very small VU meter. Affordable! In Use: So far I’ve used it on an acoustic guitar, direct from the guitar’s preamp, miked electric guitar cab, miked fiddle, and on vocals. Acoustic guitar: This was my very first experience with the unit. I plugged in my Takamine TAN15 with a “cool tube” preamp into the instrument input. I set the EQ on the guitar to flat. I was quickly able to dial in some very clean and musical EQ on the RC 500—I set a bit of boost at about 100hZ with the low band set to peak, some scooping at about 800hZ on the mid band and about 3dB of boost at 7 or 8K on the high EQ,switched to shelving. When I engaged the compressor and began adjusting, I found myself getting a little too funky with the gain reduction. After looking more closely at the VU, I found I was in the ‘hood of 12dB of gain reduction! There was some pumping going on. After adjusting the threshold and getting the gain reduction to peak on the very loudest parts at 6dB of gain reduction, it started getting NICE! The guitar sat very nicely in the mix! I layered four parts and normally have to strap a software compressor on the buss to have it sit where I can hear it, but I haven’t had to do it with this thing. Impressed! Electric guitar cab: I used a Les Paul>Marshall JVM205 with some nice crunch dialed in>a pair of Celestion V’30’s in a Mesa cab>Senneheiser e609>RC 500>Mytek A/D>Roland VS700 via AES>DAW (Sonar X3). This is where the EQ SHINED! Miking this rig has been a lot of hit and miss to get right. The combo of the guitar/amp/speakers seems to produce a bit too much brightness for my taste at around 4K, and not quite enough mids to cut through the mix. In this case, I left the bottom eq flat, boosted about 3 or 4dB at 1.6K and cut about 3dB at 4K using the high EQ set to peak.The guitar was near freakin’ perfect! The mid’s help it cut through like I’ve not quite heard yet- very “Marshall-ish” sounding—the bomb, man! Miking a fiddle: I had a local and well-known Zydeco fiddler in for a session. I used a Neumann TLM103>RC 500>Mytek A/D>Roland VS700 via AES>DAW. I engaged the 80hZ high pass filter and cut everything below 150hZ by 16 dB. I cut a bit of the mids, about 2dB at around 1.2K. I added some air at around 10K (set to shelving) with a boost of about 3dB. The compressor was engaged, and on the loudest parts, I adjusted to get no more than 6dB of gain reduction. We were both very impressed with this. We cut three songs and as I was backing up a song, the fiddler continued to play as if he were digging what he was hearing more than he had before! Vocals: I used an SM7b>RC 500>Mytek A/D>Roland VS700 via AES>DAW. This mic has a well-known reputation for requiring a LOT of gain. NO PROBLEM with this box! I did have the gain up substantially from the Neumann, but didn’t notice the noise floor rising at all. I adjusted the compressor to the sweet spot, which seems to be about 3 to 6dB of gain reduction on the loudest passages. I engaged the 80hZ high pass filter. The EQ was set to a bit of cut below 300hZ on the low EQ, set to shelving. The mids were cut about 3dB at 500hZ. I added a little top end at about 9K with the high EQ set to shelving. The vocal sits beautifully in the mix! This box is the real deal. No corners were cut from the sonic perspective. Ok, it’s made in China. I live and in work down here in south Louisiana near where PreSonus is located. Sure, I wish it were built here in the USA, but I can understand cutting costs to produce a box with this kind of quality! For the record, I’m comparing this unit to some boutique mic pres in my studio made out in California that cost almost twice as much. If you can get past the import issue, you can rest assured that it’s $800 WELL-SPENT! The RC 500 is hanging easily and evenly with the more expensive gear in my studio. I’ve used it exclusively for a week now. 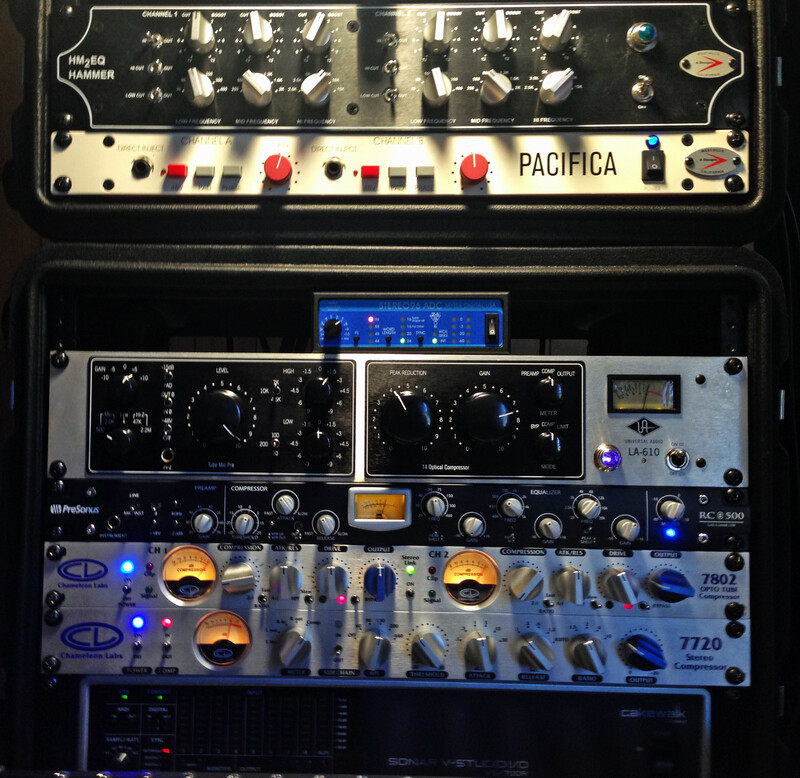 While I can get the compressor to pump if overused, the same is very true about the LA610 that sits in the same rack. I can’t see how anyone could go wrong with investing in this box! Bass Extremists Victor Wooten and Steve Bailey bring the low end like no other, and when paired up, it’s a sonic maelstrom of intergalactic proportions. Both are running their basses directly into ADL 700s for this performance. Recording a guitarist with as signature a technique as Steve Dodds introduces some unusual recording quandaries. Fortunately for 5aint, his PreSonus AL 700, ADL 600, StudioLive digital mixer, and Studio One DAW provided everything he needed for the task at hand. Dodds’ signature “guitabla” stylings are in high demand, as he has been a prolific session player and frequent collaborator with the likes of Steven Stills, Sarah McLachlan, Karen Eden, and more, having worked on projects with notable producers like David Kershenbaum, Jill Joes, Alan Moulder, and Martin Page. His more recent focus has been on his dynamic, genre-blending solo material.